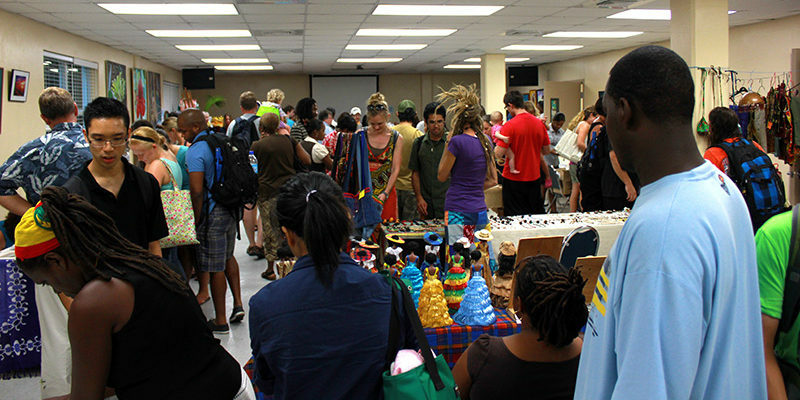 The RUSM Art and craft fair is an annual even hosted by Ross University geared towards raising awareness of local culture while simultaneously raising funds for local charities on island. This year has been quite an interesting one as artist and craftsmen came from all over Dominica with their paintings, wood carvings, woven baskets, walking sticks, calabash, island photography, dolls, jewelry, and souvenirs to take part in this grand event. At the fair, quit a few of the attendees got paintings and crafts and participated in a many of the fund-raising events but one of the artist that caught my attention was a gentle man by the name of Ray Francis who’s artistic concept was literally outside of the box, his paintings featured elements from his scenes protruding out of the canvas, one could actually feel and hold the hands and feet of the paintings. While making my rounds I stumbled upon Orlando who has been a very frequent contributor to the event. He showed me some of his work and explained that the carvings were all skillfully carved from a single block of wood (no room for error) wow! . an there was Kathy Sorhaindo who has no facebook or twitter account (even my 4moths old baby has his own account LOL ), fortunately she had a hotmail address who created jewelry from copper and rare pieces of glass bottles washed up from the sea. Just before I left the art fair I bounced up with Kelvin James who has been a close buddy, he is full of raw talent; he has mastered the art of painting water and is not afraid of trying new concepts. There were many other artists like Earl Etienne, Petros Meaza and many more that I came across and they all had very interesting art pieces and collections to numerous to mention. Oh I wish that there were amenities of that sort when I was growing up in Portsmouth 40 to 50 years ago.